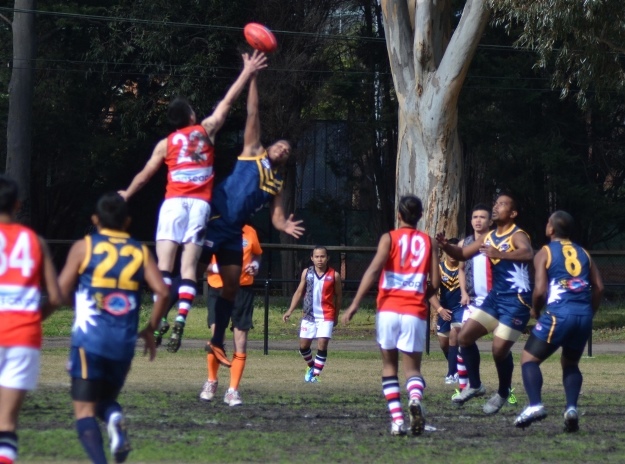 The third game up on McAlister Oval pitted IC regulars Nauru against IC newcomers Indonesia. It looked like a mismatch and that's how it turned out but even in these matches there is much to be learned for the minnows. 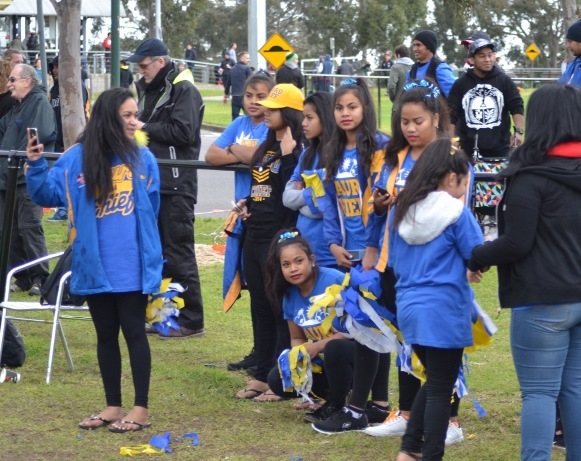 Under increasingly threatening skies that had so far held off - the Nauru cheer squad took position by the fence and one Oppenheimer Kenneth in the goal square. The diminutive Indonesian side was always going to be struggling against the hardened Nauru outfit. 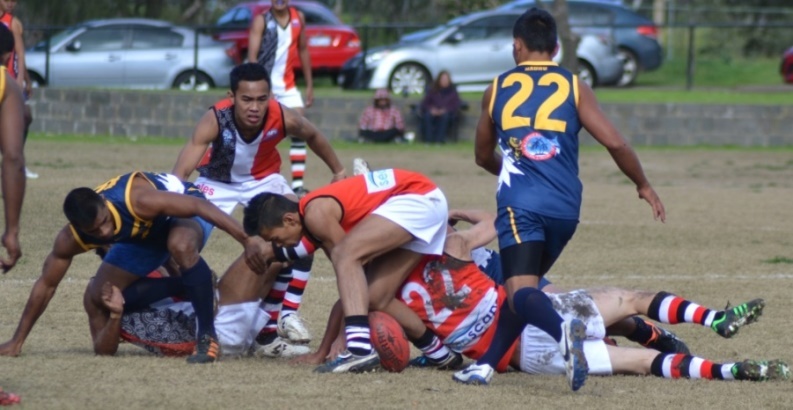 While Nauru may not have the height they certainly have the footy pedigree (being the national sport) and man for man had the weight advantage. Oppenheimer Kenneth (#2) was on song from the start bagging 4 first quarter goals and appearing a class above. The Indonesian squad impressed with their attitude, never giving in despite being clearly mismatched. The early reward was not quite the main prize – a shot on goal by Dimas Adi Prasojo (#7) looked to be tracking for a goal but faded. The behind however was their first score in the International Cup. 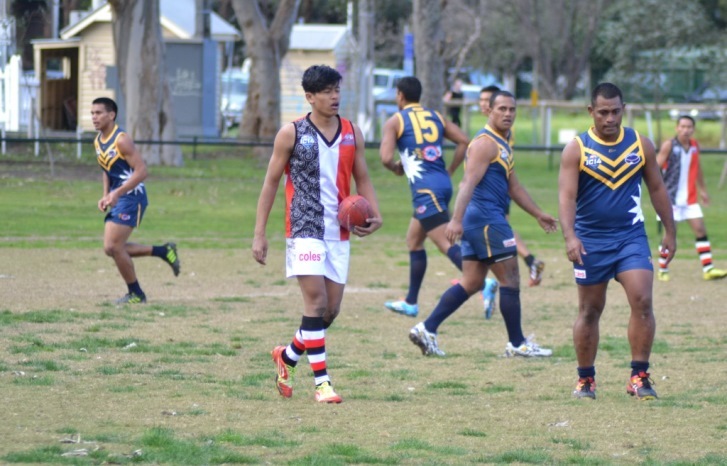 By quarter time Nauru had kicked away by 7 goals and would only extend the lead further through a dominant second quarter – however, against the trend of play Indonesia brought the ball forward and a mark and goal to Dillah Syah Abdillah was something to hang their hats on. Thereafter, the rains came in the third term as a cold, cold wind blew through. 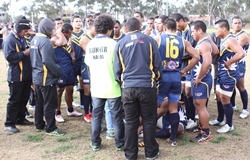 Nauru continued to pile on the pain and ran out eventual victors – and taking the ‘sweep’ for the round with a final withering burst of 11 goals in the final stanza. Kenneth finished with 9 of the best in a dominant display supported by Donatallo (#12) and Jonas (#7) in what was really a team effort. Indonesia took positives out of the game, including the pace and flair of Daichi on the wing, Bachtiar and half back Aleiandro tried hard as did Vincent Halim in the midfield.